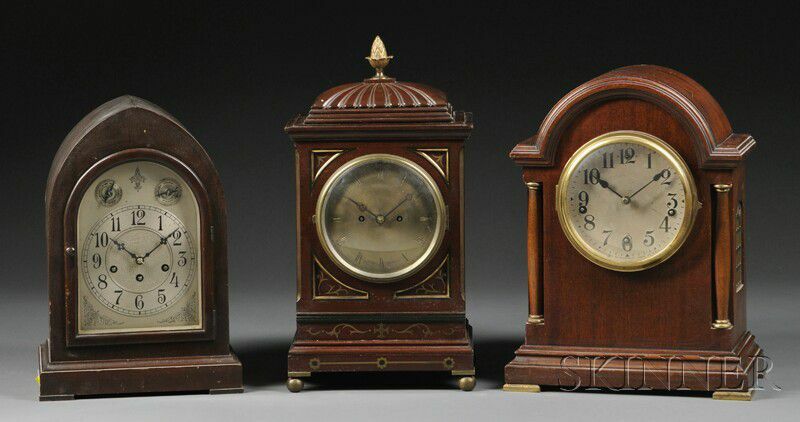 Elliott Mahogany Table Clock and Two Others, the Elliott with carved caddy top and brass inlays, 5-1/2 in. diameter brass dial marked Elliottt London with Roman numerals, eight-day time and strike fusee movement, ht. 18-1/2; a lancet-shaped Seth Thomas eight-day Westminster chime table clock with Arabic numeral dial, ht. 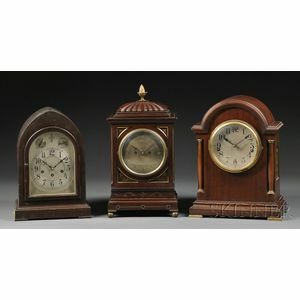 15; and last a Waterbury dome top eight-day Westminster chime clock with a 6-in. Arabic numeral dial marked Waterbury Clock Co. USA, ht. 16 in.